Explanation: What are these strange color bands being seen from the International Space Station? The Sun setting through Earth’s atmosphere. 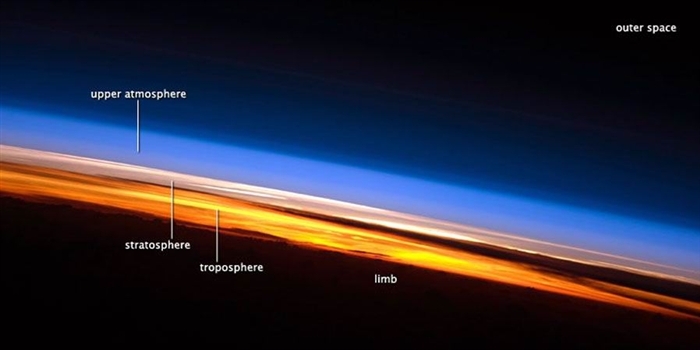 Pictured above, a sunset captured last month by the ISS’s Expedition 23 crew shows in vivid detail many layers of the Earth’s thin atmosphere. Part of the Earth experiencing night crosses the bottom of the image. Above that, appearing in deep orange and yellow, is the Earth’s troposphere, which contains 80 percent of the atmosphere by mass and almost all of the clouds in the sky. Above the troposphere, seen as a light blue band with white clouds, is the stratosphere, part of the Earth’s atmosphere where airplanes fly and some hardy bacteria float. Above the stratosphere, visible as a darker blue bands, are higher and thinner atmospheric levels that gradually fade away into the cold dark vacuum of outer space. Sunset is not an uncommon sight for occupants of the International Space Station, because it can be seen as many as 16 times a day.